The purpose of this study was to examine the efficacy of CES on anxiety in horses across 4 trials. The investigators were interested in the effect of CES on anxiety. The time spent dozing is a variable in the horse that reflects decreased anxiety. This abstract will focus on the outcome variable of dozing rather than anxiety because strict observational measures were taken for dozing behavior. This was a 2 phase open-label animal clinical trial. The pilot study was done to establish that CES would not pose any threat to the welfare of the horses and to determine the appropriate CES treatment setting. Results from the pilot study were: (1) the horses accepted CES therapy without incidence, and (2) The current setting of 200 µA was found as to be the most appropriate for the larger Phase II study based on the horses’ behaviors. The primary effectiveness endpoints for this open label were the change from baseline in the last post-treatment observational scores on 27 horse behaviors. In this abstract, only the amount of time spent dozing across trials 1 – 4 will be discussed. 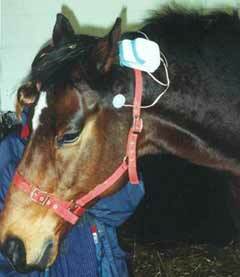 The Alpha-Stim CES device was attached to bridle of the horse and the electrodes were placed using a standard position above the point of articulation of the lower jar, just below the ear after the area was soaked with saline so there was proper conduction (See Figure 1). Each trial began with the investigator waiting for signs of acceptance of the CES from the horse before proceeding. There was one baseline measurement (trial 1) followed by two 10 minute CES treatments with the current set to 200 µA (trials 2 and 3) followed by a final endpoint measurement (trial 4) at 2 days later in an 8 testing day period. There were 4 testing periods during each day; 10-11 AM, 2-3 PM, 4-6 PM and 6-8 PM. Each horse was tested once during each time slot over the 8 days of testing. Baseline measures were taken at trial 1, 20 minute CES treatments were done during trials 2 and 3 and endpoint measures were done during trial 4 using a detailed and specific ethogram used for behavior studies and behavior states in the horse and a rating sheet for specific behaviors. Figure 1. The CES device was attached to the bridle of the horse and the electrodes were placed using a standard position above the point of articulation of the lower jar, just below the ear after the area was soaked with saline. Trial 1 lasted 10 minutes (CES device was on bridle, but current was off). In trials 2 and 3, the current on the CES device was set to 200 microamperes after the horse had habituated to the device and CES treatment lasted for 20 minutes. Endpoint measures were taken during trial 4 (no CES treatment). This was an observational study of selected horse behaviors including dozing using a detailed strict protocol that included an ethogram and behavior recording sheet. Eight horses (2 fillies, 3 mares and 3 geldings with varied backgrounds based at the De Monfort University Equestrian Center and Field Station at Caythorpe, Lincolnshire, UK were selected as subjects for this study. Protection of the horses from stress related to the CES treatment was a primary concern of the investigators. The decision was made apriori that if a horse did not habituate to the CES treatment and seemed stressed the treatment would be immediately stopped and that horse would be excluded from further trials. All equine subjects in this study accepted CES treatments without difficulty. Paired t-tests, correlation and descriptive statistics were used for data analysis in this study. Figure 2 shows the amount of time the 8 individual horses spent dozing during observations across different trial phases. Figure 2. Amount of time spent dozing for each individual horse. A comparison of the means for the amount of time the horses spent dozing across trials 1-4 was significant (p<0.05). There was a significant correlation (p=0.013) between the time spent dozing and at trial phases 2 through 4 as seen in Figure 3. Interestingly, the outcome measure for dozing was held 2 days later after the final CES treatment, yet the time spent dozing increased after the last CES treatment with the final outcome measurement indicating a longitudinal effect. Figure 3. Mean Time Spent Dozing. The time spent dozing increased significantly (p<0.05) from trial 1 to trial 4. The proportion of time spent standing dozing across phases was found to have a positive correlation with the trial phase (r=0.220, p=0.013) the time spent dozing increasing in each successive trial phase. 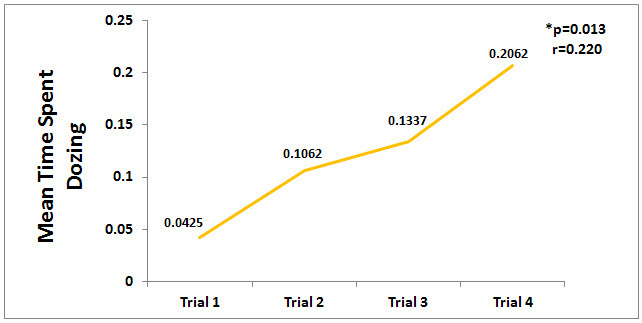 The time spent dozing across trial phases had a negative correlation with the time spent standing alert (r=-0.945, p<0.001), time spent eating bedding (r=-0.205, p=0.05) and time spent eating forage (r=-0.331, p.001). Strengths of this study are; it uses an animal model to examine the effect of CES on increased sleep, and it used a well-thought out, detailed strict protocol for the administration of the CES treatments and the observations that were made during the testing period using an ethogram and behavior recording sheet. This study also provides a foundation for a larger RCT on the effect of CES on horses. Limitations of the study are; the small N, the absence of a control group, and the use of t-tests for analysis (paired t-test was commonly used in the 1990’s and early 2000s where today a repeated measures ancova or similar statistical test would most likely be used). The significant results of this horse study are consistent with the significant findings of Alpha-Stim® RCT human studies on the effect of CES related to sleeping behavior. NC, DM, JM, DeMontford University Lincoln, Caythorpe Campus, Grantham, Lincs., United Kingdom.